Dr. Michael Nevradakis - ... See More Host of Dialogos Radio and Contributor to Mint Press News | Is a Fair and Open Internet an Attainable Goal? Tom Luongo - Geopolitical Analyst and Publisher of the Gold Goats 'n Guns Newsletter | What do the "Geniuses of the Left" Have Planned for the Rest of Us? Danny Sjursen - U.S. Army Officer and Former History Instructor at West Point | Are Mainstream Liberals Now the Modern Day War Hawks? Political protests and activist work is often framed in a biased manner depending on who is reporting on the events at hand. Independent journalist Ford Fischer joins Garland and Lee by phone to talk about his time covering political protests and how he views the different groups that gain the most attention in the mainstream media. Regardless of the issue, some individuals seem dedicated to opposing any policy promoted by President Trump. 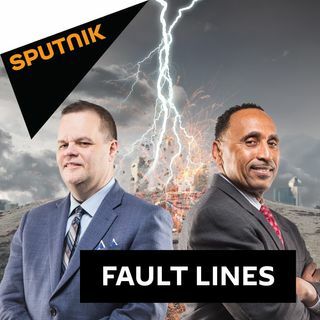 US Army Officer Danny Sjursen returns to Fault Lines to talk about how this is playing out on the foreign policy front as it appears that many mainstream liberals have now become the modern-day war hawks. For the final segment of the week, Garland and Lee are joined by talk host and entrepreneur Tim Black for a round-up of the week's major news stories. Following his surprise win in this week's Florida Gubernatorial Democratic Primary, does progressive Andrew Gillum have a chance to defeat Ron DeSantis to become Florida's next governor, or will Republicans hold the office in the battleground state carried by President Trump in 2016?